J Frank Bamfield was born in Yorkshire and arrived in Sydney c1890. He lived at ‘Ventnor’ Holt Street, Stanmore. He married Elizabeth (Lizzie) Johnstone in March 1893 at St Stephens in Newtown. He died at his home in Baroona Road, Northbridge in 1934. His wife and three sons survived him. Bamfield was employed for 10 years at Antony Horderns in the boot department. He bought A G Horton’s shoe store in Newtown in 1907 and established a chain of shops. A prominent Mason, he served as Grand Director of Ceremonies and also as District Grand Inspector of Workings. He was a Past Master of the Mark Lodge, and a Past First Principal of the Royal Arch Chapter. He was a keen lawn bowler, and was an interstate player. He was president of Victoria Park and Petersham bowling clubs for several years. J Frank Bamfield was an alderman on Newtown Council, representing O’Connell Ward, from 1911 to 1919, and its mayor in 1913-1915. 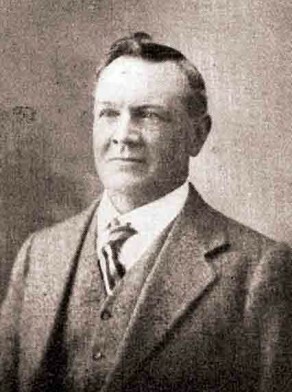 He was also acting mayor in 1912. According to his obituary, he also served on Petersham Council.